Hello all. As is implied by the title of this post we hope all who celebrate the same holidays we do had a Very Merry Christmas and a Wonderful New Year! To all others, we wish you the best of whatever you choose to celebrate. 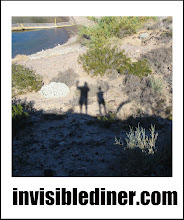 We have taken a long hiatus from posting on Invisible Diner. As unintentional as it was, the reasons are many and range from vacations out west, the holidays, and personal health scares. Now that they are all behind us (hopefully) we look forward to a great 2008. Thank you very much for visiting and your continued support.